There have been at least 110 shootings in Chicago since Jan. 1. 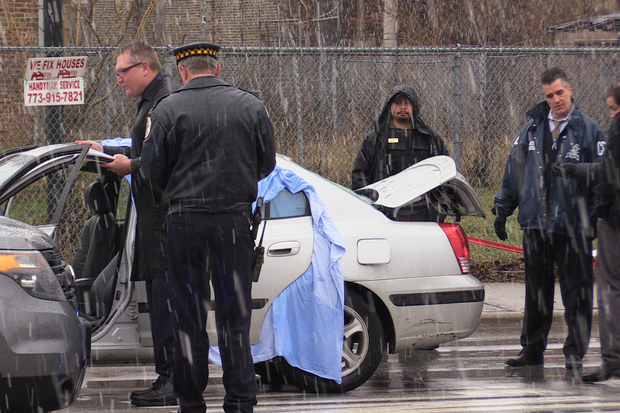 This one on Jan. 9 at 51st and Halsted left one dead. CHICAGO — In a bloody start to 2016, 110 people were shot during the first 10 days of 2016, 2½ times the number shot during the same period last year, according to DNAinfo records. From New Year's Day to Sunday, 17 people have been killed and 93 others have been shot. "So far this year, the majority of the gun violence we've seen are a result of chronic gang conflicts driven in part by social media commentary and petty disputes among rival factions," Police Department spokesman Anthony Guglielmi said in a statement. Guglielmi said "illegal guns" remain a major problem in Chicago, an issue that former Supt. Garry McCarthy pointed to regularly. On social media, Rev. Michael Pfleger of Auburn Gresham's St. Sabina Church showed his outrage as the numbers documenting the carnage came in. "In the First 10 days of January 19 People have been KILLED and 101 WOUNDED...That's nearly 2 per day killed and 10 a day Wounded......And the City thought a Movie called CHI-RAQ would give Chicago a BAD name....How about Corruption, cover-up, and the fact that we are the Deadliest City in America........?" the prominent priest posted on his Facebook page. Over the same period in 2015, six people were fatally shot and 38 others were wounded. "Going forward, CPD will continue to relentlessly target gun offenders," Guglielmi said adding that McCarthy's replacement, Supt. John Escalante "has increased the deployment of gang enforcement teams to help address possible acts of retaliation" in areas where shootings have occurred. This year has had a number of shootings in which multiple people were shot, including a North Lawndale shooting that killed one and wounded four, a North Center shooting in which three people were shot including one fatally, and a South Shore shooting that killed two teenage friends. November through March usually see fewer shootings than the rest of the year, data shows.